the icon you put is worst than I though Father Ambrose...it has Christ pointing towards his mother!!!! We have Our Lady of Victory parishes too. But the card that the Professor displays here is not a usual or frequently found image. I have never seen anything like it before. The real question I have about these Marian definitions, mediatrix/co-redemptrix and others, is why are they necessary? In Orthodox theology, we define that Mary is ever-virgin and Theotokos. Both of these doctrine refer back to Christ and His nature and were necessary to combat rampant heresies. But how do these marian definitions point back to Christ and help us to understand Him better? To me, all they seem to accomplish is to elevate her status, role, and activity in the Christian life, and marginalize those of the Holy Spirit and Christ. That's a legitimate fear that needs to be addressed. I just want to add that I personally don't find the "Co-Redeemer" beliefs an issue at all as long as it is "properly" interpreted. I did before mention elsewhere the prefix "Co" is a problem to many here, as if it's an equal. We do say the Son is "co-essential" with the Father for instance. Nevertheless, I'm not one who argues with semantics, but at least one should probably ask the Pope of Rome for his next major sermon or writing to clarify what the Theotokos is not rather than what she is to destroy or quell any uncertainties in debates like this. Wow, i've never heard chanting like that! Very complex harmonies! Thanks for posting. 1) Why do the hands point downwards (Hell...?) instead of towards Christ ? 2) Why are they on a globe like the questioned "lady of all nations" image of Roman Catholics? They both have the Virgin with her hands or feet (authority) on a globe. If Mary is the lord of this world that is a blasphemy for we know who is the lord of this world. If Mary is the Lord of the World to come that is an even greater blasphemy for that is equating her with God. 3) Again why does she have the scepter which belongs to her son (Psa 2:9; Rev 2:27; 12:5; 19:15) ? 4) Why does Christ point towards her and not her to Christ ? 5) Why does it depict the Father breaking the canons of the Church and scriptures which say he is unknowable except by the Son? 6) She has a Crown to signal her Queenship yet Christ has no sign or symbol of his authority whatsoever except a halo (and hers is bigger obviously). 7) The scepter looks highly breakable....like a reed scepter used to mock false kings! Notice the darkness surrounding the image. What does that tell you? you shall not listen to the words of that prophet or that dreamer of dreams; for the LORD your God is testing you to find out if you love the LORD your God with all your heart and with all your soul. Last, you said in another thread the red traditional colour was the true Virgin Mary and other colours (specifically Blue and White) could not be possible. Behold the false teachings in this red coloured garment icon! My thoughts, exactly. Why over define those things upon which the foundation of the Faith was determined in the days of the ancient Fathers and the Councils of the undivided Church? I don't get it. 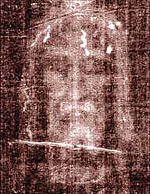 The sum of your objections appears to me that the Mother of God could not have given this icon to the Russian faithful. Instead it must be a revelation..... from hell !!? I just want to add that I personally don't find the "Co-Redeemer" beliefs an issue at all as long as it is "properly" interpreted. Exactly, and all those in this thread and elsewhere who purposely misrepresent the teachings of the Holy Catholic Church will receive God's judgment at the end of their life. Father, I don't think I'm surprised. Many anti-OO's (EO's no less...Patrick Barnes among them) have described our Lady of Zeitoun as a demonic apparition to discredit the Coptic Church. You don't see the insults because you're one of those who has been flinging them. Historical accounts are being cited; how are those an "insult?" I am so done with Orthodoxy now - this place has really poisoned it for me. There's far more truth about the Orthodox on display here than any kind of truth about the Catholic Church. The Orthodox Truth of the Catholic Church just repelling the evil of the generation which seeks signs and visions. Is that St. Peter's rooster crowing? or just the cackle of his self-proclaimed vicar? The explanation I gave shows that it is not at all heretical. "Co-" in this case does not mean "equal to," it means "with" as in cooperated. That you want to consistently misrepresent Catholic teaching indicates that perhaps you are not that secure in your own faith. I know you think The Theotokos "co-operated" with Christ in your redemption. You now even depict her with a cross and wounds on her hands to show it. Its garbage and heresy. Christ alone redeemed both us and His Mother. The Theotokos is subject both to the conditions of the fall, and the redemption of Christ. She is not a "Co-redeemer". She has been redeemed. And all your squealing and ad hominems won't change that. Do you even know what the word "cooperate" means. It does not mean she is on an equal footing with Christ. We all cooperate with God whenever we do his will. The new title for the Theotokos indicates that, as the Mother of God, she cooperated with God in a special way. So you can flail around and whine and take my words out of context and say that I am attacking people, but you are only giving a bad witness to "Orthodoxy" as well as proving everything I have ever said is wrong with this forum to be true. As far as that image. Yeah, I agree that is going a bit far. However, A. It does not accurately represent the teaching of co-redemptrix, and B. I am not going to abandon my Catholic faith just because someone who claims to be Catholic makes an image that I do not like. What happens when the Vatican blesses it? I don't think it will, but if it does it is important to note that A. it does not depict Mary hanging on the cross; B. those indentations in her hands indicate she was wounded too by experiencing the pain of seeing her Son crucified; C. if it is approved, it would simply mean it is approved as a private devotion and, thus, I have no obligation as a Catholic to participate in it since it is simply another devotion which we may utilize; and D. it is a metaphor. It does not literally mean Mary was crucified for our salvation (see B). As distinctions-if they even make a distinction-without a difference. Try to say you don't believe Fatima is true, and find out how much obligation is lacking. Read what Maxmillian Kolbe did with the Lourdes, promoted now by the major theologian of a major university/seminary of the Vatican's, and you see how little any of you "distinctions" stop the snow ball from rolling. As for Mary hanging on the Cross, you have to save something for the next batch of "revelations" from the new generation of "seers" and "visionaries." When I see the Coptic Orthodox Church start to teach bizarre dogmas and promote strange cults centered on the Theotokos, I'll see the similiarity. What will those who defend the teachings of the Holy Catholic Church against the misrepresentations by the Vatican's "visionaries" receive? Just a note on the "suffering marks" of the Theotokos in Catholic depictions, we do understand there is a tradition of miracles people suffered through called the stigmata. For the benefit of the doubt, perhaps this is a symbolic "stigmata" that many other faithful can experience. A Tradition of the Coptic Orthodox, or a tradition of the Vatican? But I don't believe Mary suffered and died on the cross. Now you are misrepresenting what I said. On another forum on a thread brought to my attention from a poster, someone is trying to prove purgatory from the visions of Fatima, with the taunt "was Our Lady wrong?" To answer his question: the Bible says that the rich man was in hell, explicitely (how he misses that I can't see), so if the vision of Fatima says that the rich man was in purgatory, then the vision is wrong, in which case it wasn't our Lady. Btw, this is precisely what told me Medjugorje can't be true. Why so? Catholics cannot practice birth control under severe and permanent penalties and can be canonized by performing self-mutilation in the names of Jesus and Mary? Permanent? Ever heard of the Sacrament of Confession? I have in the Orthodox Church. I don't know (or particularly care about) what Confession means in the Catholic Church? I see huge billboards and on buses calling Catholics to Confession during Lent and other times of the year, which is a good thing even if one committed sins with permanent consequences. This forum has been around for 8 years? If such evidence is unearthed by our Catholic friends, we can deal with it when the time comes. I don't feel the need to dig up dirt on your Church because I am charitable. When others and I report historical facts about Roman Catholic Saints, that makes us uncharitable? Who does not speak for the Catholic Church or the Orthodox Church, so your point? Officially, Vassula does not speak for the Catholic Church ... what goes on inside these increasing Marian "cults" is a different story. That's the best you can do to counter the canonization of a cutter while women are condemned for taking birth control pills? You really have some anger issues when it comes to Humanae Vitae, which is funny because you constantly prove that you haven't the slightest idea what it is actually saying. I am an Orthodox Christian; Humanae Vitae and ALL Papal Encyclicals mean zero to me. I might have missed the picture of this...where is Mary hanging on the Cross? Behold...the fruits of the sin of schism running rampant in this forum and they are all too blind to even see it. Show me where self-cutting and self-mutilation aren't sins in the Catholic Church. There is no tradition of stigmata in the Coptic Church. I don't know where you're getting the idea that I'm advocating a Coptic tradition when I said "Catholic depictions." I'm simply trying to understand what Catholics think, especially with the picture where there's light radiating from a certain point in the palm of her hand. That's all. You are assuming that the Orthodox will unite with Rome ... Who will perform the purging of Orthodox who refuse to recognize the thousand years of Papal Encyclicals, Papal Bulls, Papally adopted visions and other Papal infallible teachings? When I go to the Coptic Church, and we pray for the Catholic Church, we aren't praying for the Vatican. Just checking. Since the Copts have the Tradition of Kiyahk, the visions of Zeitoun etc. and yet have produced nothing like the traditions of the Vatican we are discussing here, I don't see any similiarity. Okay...I meant the Roman Catholic Church, not the Orthodox Church. So you're not the least bit worried about people misinterpreting "the salvation of our father Adam" or "the redemption of Isaiah" or "the grace of Elijah" as Coptic titles of the Theotokos? How long have they been singing that in Egypt, and no bizarre dogmas on the Holy Thetokos have sprouted? No, not the least bit worried. If they started taking such titles out of the context of the poetry of the hymns, then I might reconsider. OK, then I apologize for all the times I prayed that the Russian people would be saved from the evils of Communism. Obviously I had no right whatsoever to do that. Only the Orthodox may pray for the countries in which they reside. I get it now. Just wanted to make a note on the above. I have seen prayer books from the 2000's that have the above words in them. However, today I received a 2010 edition/printing, and (if I'm looking in the right place) it now has been changed to: "Save, O Lord, and have mercy on the Russian Land and her Orthodox people both in the homeland and in the diaspora, this land and it's authorities". I hate to say 'duh', but any ultimate unity that might ever, ever come to pass will be through the work of the Holy Spirit and the 'thousand years of .......bull...' (couldn't help myself there with the editing... ) obviously would not be part of the package of dogma binding on all. All of that has to be parsed out and either be explained away or be rejected. I've come to realize over the years that the definition of doctrine or dogmatizing a teaching means something much different and much more legalistic to the Orthodox than it does to Catholics. As distinctions-if they even make a distinction-without a difference. Try to say you don't believe Fatima is true, and find out how much obligation is lacking. The Church teaches that none are required to believe any of the apparitions or mystical experiences of any person, regardless of their rank in the Church. If you are going to destroy Catholic teaching as you have now said twice that you intend to do so where ever and whenever you can, and I mean the teaching of my Church, the one holy catholic and apostolic Church, then you most likely should be able to identify that teaching or you'd be wasting good powder blowing up phantoms. Also, Professor, you might want to remember that others far more qualified than you are have failed. What were the objections if I may ask? Describe the apparition to me and the objections. By the way, orbs I have seen in so called "UFOs" and other such questionable phenomena. I die with my son with each hard stroke that life gives him as if it were me who were taking the blows. I know it is not the same as actually taking them, but my pain is nearly inconceivable save to some other mother who agonizes the same way. So I see that light, not as her pain, but as his light, his grace, his love shining through her to us. How blasphemous, I know...such heresy...I realize. But I do believe she is the Mother of All Grace. And as a mother, I have no difficulty understanding her humanity, however exalted she may be. The Orthodox are the Catholics. As for the Vatican, it is the one who engages in all this hair splitting, micro categorizing etc. And like the law, in the end it doesn't clarify anything at all, just muddle them some more. Like trying to pin you all down on ex cathedra and magisterial statements, such on these bizarre visions and the strange cults they inspire. Your collective lips say no, but your collective acts say yes. your "church" adulterated the Orthodox Creed of the One, Holy, Catholic and Apostolic Church, from whose teachings the Vatican has departed, in this embrace of "visionaries" as a basis of the Faith we believe in, as elsewhere. then you most likely should be able to identify that teaching or you'd be wasting good powder blowing up phantoms. LOL. All I've had to do is say I don't believe in the phantoms of Fatima and Lourdes (Guadalupe is different), to see the reaction among devotees of the Vatican that I had correctly identified its teachings and struck a nerve. They kept the pure Orthodox Faith of the One, Holy, Catholic and Apostolic Church pure and Orthodox. That hared headed ultramontanists persisted in their heresy doesn't mean the former failed. Does that mean I'm doing a better job than Isa in destroying Catholic teaching. I never saw Isa nor any other Orthodox poster claim that the Catholic Church has a Patron Saint for women who cut themselves. Whether thousands of young impressionable girls cut themselves or thousands of soldiers kill in the name of Rome, those sins can't be hidden under a bushel. Lederer is known as "the Poker Professor" because of his demeanor, analytical style and long history of wins. Isa is analytical with a long history of wins and he's a Teacher, not a Professor. Oh that's interesting. As far as I know, your Pope hasn't actually promulgated the dogma of the "Co-Redeemer", yet you are telling us that believing it is an obligation and failing to do so will cause us to "receive God's judgment [sic]". So you believe this un-promulgated dogma out of fear of hell do you? Did some scary "vision" tell you what to believe? Of course, we are very vehement in teaching what the Theotokos is not in addition to what she is. I just feel that our language can be equally misconstrued by the simple minded people. Roman Catholics outnumber us by a vast number. It's no surprise you might easily find some fringe elements that might give way to heresies like the "quasi-incarnation of the Holy Spirit" or Vassula's alleged beliefs. I think we just need to be a bit more charitable in our discussions with Roman Catholics. If they make it clear from their teachings something they don't approve, or how to properly interpret certain phrases, then we should argue based on those merits. That's all. Of course, I don't have nearly as much knowledge as you do when it comes to Roman Catholic history. So I may be wrong in the end concerning giving Roman Catholics the benefit of the doubt. But at least, so far, we have not yet had a Catholic who believed in bizarre Vassula Ryden beliefs posting here. As for depictions of the Theotokos on the Crucifix, where do you find this? And maybe I missed it here, but I'm sure the Roman Catholics posting here won't approve of it. It is important to reinforce the following fact, regardless of what others might say about it. Does that mean I'm doing a better job than Isa in destroying Catholic teaching. I suppose its safe to say that I don't think you have quite the same genius as The Professor. Dishonesty again. You did not provide my entire quote but only a snippet taken out of context. If you would have read this in the context of my entire post you would have realized that in point "D" I mentioned the image can be taken as a metaphor. It is either a metaphor or an indication that the Mother of God may have received stigmata as someone else in this thread hypothesized. I think you, Fr. Ambrose, and ozgeorge know what our Church actually teaches and knows that we do not actually teach that Mary was crucified. You would just rather perpetuate falsehoods because you hate our Church. I have explained time and again (as have others) that "Co-Redemptrix" does not mean that Mary is on equal footing to Christ, but explained that she cooperated with God just as we all cooperate with God when we do His will. It is not that hard of a concept and I have a very difficult time believing that my explanation is truly going over all of your heads. It is just easier to hate sometimes, isn't it? It is remarkable how you manage to misunderstand every single post I make. Methinks if you were less angry and reactionary and actually READ what I said you would have less difficulty. I am not talking about people who don't believe in the wording "co-redeemer" being damned. I really couldn't care less whether you believe it or not, nor do I care whether any Catholics do or not since it is not a dogma. The discussion of whether or not it will ever be a dogma is just speculation. The part I was talking about that is damning is people like you trying to peddle a false image of the Catholic Church by claiming it teaches something it does not teach. The Catholic Church never has nor will it ever teach that Mary died on the cross for our sins. That is heretical to us and you know it is so stop being dishonest. One picture that shows Mary with stigmata wounds has absolutely no bearing on what the Catholic Church teaches and you know it. You just enjoy trolling. Father Ambrose, please confirm to me if that is indeed a scepter in the Virgin's hand (an untruth since only her Son bears the scepter as scripture repeatedly says) and if it is indeed a globe as in the roman catholic vision (another untruth since Mary is not the Lord of this world or of the next in any way). An icon of God cannot teach untruths. The untruth of the scepter being in the hand of the Virgin instead of her son is enough for me, but God is merciful and allowed us the hints like the globe, the enveloping darkness, and the direction of her right hand as pointers as to the ultimate source. A good trial, but did not catch me, my faith is in fact stengthened, the gates of Hell did not triumph. By the way, on the subject of icons in which the Virgin is the focus or even the sole person depicted. Why is it that the Holiest icon in existence, the first one, the one made without hands only shows Christ ? Now the Sinai icon above (the icon placed in Saint Anthony of the Desert's cave by the way) shows Christ as the sole source of Power and Authority on Earth...NOT his Mother. He holds in his hand the authority, NOT his Mother. 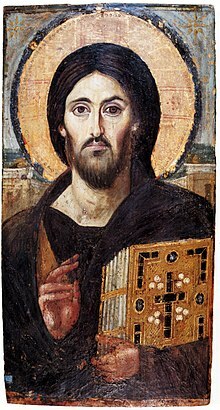 By the way...the Sinai Pantocrator icon which is said to be based on the shroud/mandilo emphasizes the two natures of Christ and their seperateness. If they make it clear from their teachings something they don't approve, or how to properly interpret certain phrases, then we should argue based on those merits. "It was she, the second Eve, who, free from all sin, original or personal, and always more intimately united with her Son, offered Him on Golgotha to the Eternal Father for all the children of Adam, sin-stained by his unhappy fall, and her mother's rights and her mother's love were included in the holocaust. Thus she who, according to the flesh, was the mother of our Head, through the added title of pain and glory became, according to the Spirit, the mother of all His members. She it was through her powerful prayers obtained that the spirit of our Divine Redeemer, already given on the Cross, should be bestowed, accompanied by miraculous gifts, on the newly founded Church at Pentecost; and finally, bearing with courage and confidence the tremendous burden of her sorrows and desolation, she, truly the Queen of Martyrs, more than all the faithful "filled up those things that are wanting of the sufferings of Christ...for His Body, which is the Church" "
This has to be said in all fairness to those who truly do know Catholic history and Catholic teaching...my Church's history and teaching. The knowledge that you refer to here can only be successfully displayed here. If we put that knowledge to the test in a fair setting, with the truly knowledgeable respondents, where one cannot simply cut, paste and point, where analysis counted as much as chronology, then there would be nothing but failure. The knowledge that you refer to cannot stand up in any venue but this one, for very obvious reasons. And that is why you only find it on display here and not out challenging those with real knowledge, insight and, in some cases, real sanctity. It is easy to play to an audience already convinced.